smartstock/iStock(NEW YORK) — Aspirin — is it safe to take? Cardiologists have recently put out new guidelines recommending that a person’s risk of life-threatening bleeding should be factored into their decision whether or not to start taking aspirin to prevent a first-ever heart attack or stroke. These guidelines, published in the medical journal Circulation, are in line with recent studies that have raised an issue with the medication. Aspirin is made of salicylic acid. It works by stopping COX-1, a specialized protein in our body that activates a type of cell called a platelet. These are found in our blood and are responsible for making it sticky. When platelets pile up, a clot can form. If the clot forms in the heart, a heart attack can occur; if the clot forms in the brain, a stroke is possible. By intervening on platelet function, aspirin can potentially prevent a heart attack or stroke — but the blood can also become less sticky, and a person can become prone to bleeding in general. In certain areas of the body, specifically the gut and brain, bleeding can be deadly. A history of certain medical conditions like kidney failure, liver failure and age makes the risks of bleeding even higher. Decades of data support the use of aspirin for the secondary prevention of cardiovascular disease, meaning a repeat event like a heart attack or stroke. In people with blockages of blood vessels in the heart and brain, including those with prior heart attacks or stroke, the rate of repeat events drops by 1.5 percent each year aspirin is taken regularly. Despite the risk of bleeding that still exists, the benefit is so great that aspirin is generally recommended to be taken as a life-long medication. “It’s an unwavering, workhorse agent for these people,” Dr. Paul Grubel, an interventional cardiologist and research director at the Inova Center in Falls Church, Virginia, told ABC News. He hopes the updated guidelines, which discuss possible risks to taking aspirin as a primary prevention — preventing something that hasn’t happened yet — don’t cause those people with prior heart attacks and strokes to all of a sudden stop their aspirin regime. “If there’s any confusion that patients have, they should not make changes in this therapy — or any medical therapy — without talking to their physician first,” Dr. Grubel said. The evidence for taking aspirin is much less compelling when it’s taken as a primary prevention, meaning to prevent a first heart attack or stroke. Its use remains contentious because the bleeding risks more closely match potential benefit. A large study in 2009, and three studies in 2018 called ARRIVE, ASCEND and ASPREE, showed that rates of significant bleeding related to aspirin were similar or even greater than the rate at which it reduced a first time heart attack or stroke. The new guidelines published by the American College of Cardiology and the American Heart Association in Circulation suggest that for a select group of people, aspirin taken for primary prevention may be appropriate. This is in line with recommendations put forth by other medical groups. 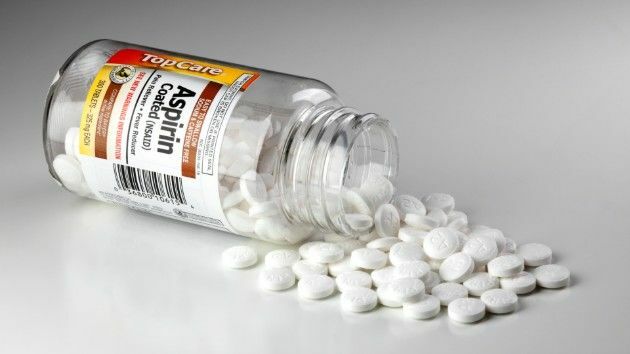 These new guidelines recommend considering low-dose “baby” aspirin every day, between 75 and 100 milligrams, in people between the ages of 40 and 70 who are at high cardiovascular risk but low bleeding risk, as determined by providers. Ultimately, starting aspirin is an individual decision that should be made between patients and their care providers, with careful consideration of the risks and benefits. If you have questions about whether or not you should be taking aspirin, you should speak with your healthcare provider first.